One of my favourite things to do is rework the more indulgent dishes out there to transform them into something a little healthier. This is mostly so I don’t need to worry as much when I eat 20 of said item as, let’s be honest, my metabolism sadly no longer keeps up with my appetite. I once had my family guessing all night as to what the secret ingredient was in the rich chocolate mousse I served them (avocado, in case you were wondering) and another time fooled all my friends with a big batch of butternut squash brownies. But the pièce de résistance (if I say so myself!) has got to be my Reese’s pieces wannabes. Sure, they still contain dark chocolate but are naturally sweetened and a far healthier option on the spectrum of indulgence. 250g unsalted peanuts, with skin // 2 heaped tsp coconut oil // 1.5 tsp honey // pinch of sea salt // 100g dark chocolate (I use Lindt 70% cocoa solids); broken into pieces. Preheat your oven to 160°. 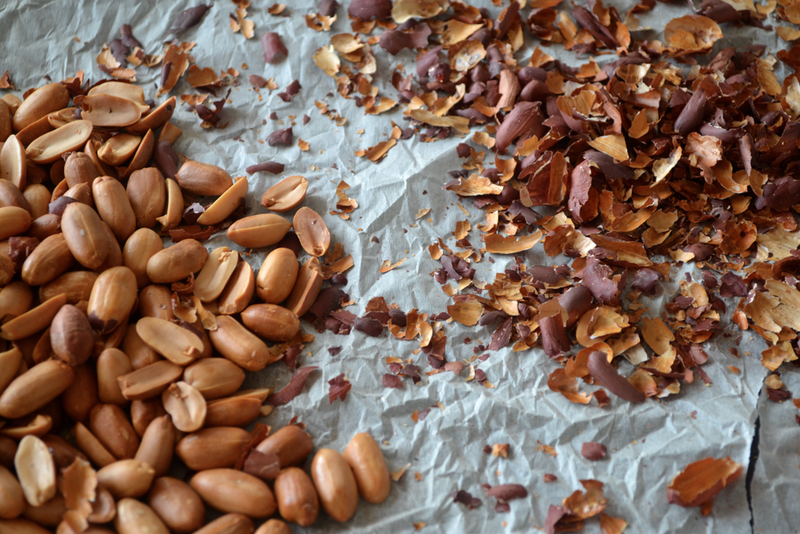 Scatter the peanuts on to a large baking tray lined with greaseproof paper and roast until nicely golden. This should take around 30-35min. Remove the skins from the peanuts by rubbing them between your fingers – it doesn’t really matter if there is a little skin left. Set aside 100g of peanuts and chuck the rest into your food processor. Add all the remaining ingredients apart from the chocolate and blitz till it’s a smooth paste. (**FYI – if amazing peanut butter is what you’re after then stop right here!! **) Now add the rest of the peanuts and pulse until they have broken down a little. You’re looking a nutty, crunchy texture. Next, melt the chocolate in a heat-proof bowl over a simmering pan of water. Pour the melted chocolate into a shallow bowl. 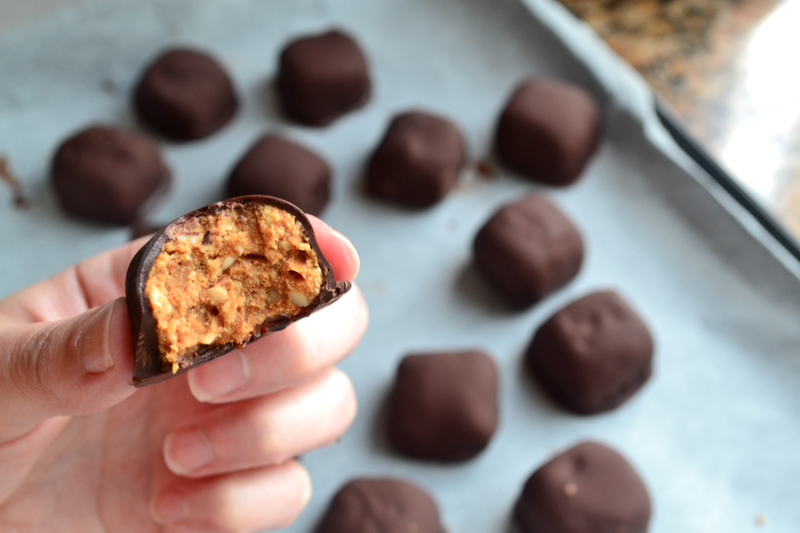 One by one drop the frozen peanut bites in and coat totally in the chocolate. 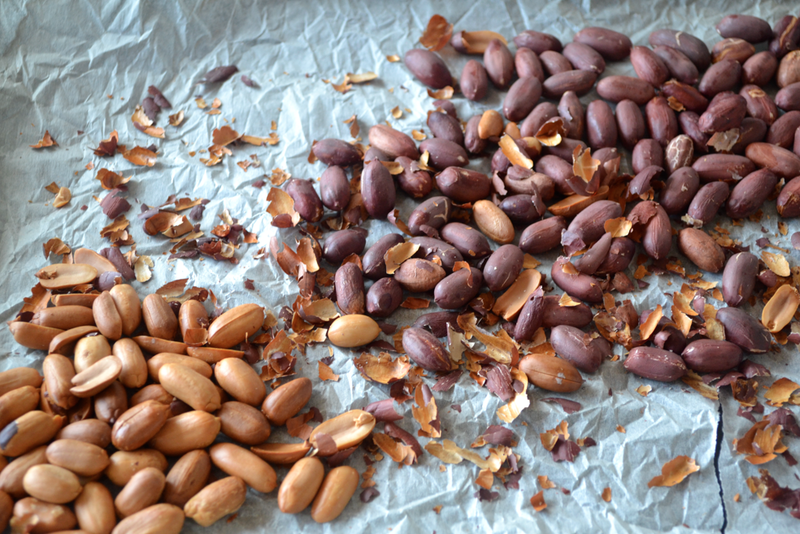 From trial and error (and a whole load of messy chocolate bites) I’ve learnt that the best way to remove them from the bowl is with a fork – allow the surplus chocolate to drip through the fork prongs and then carefully place on a tray lined with greaseproof paper. 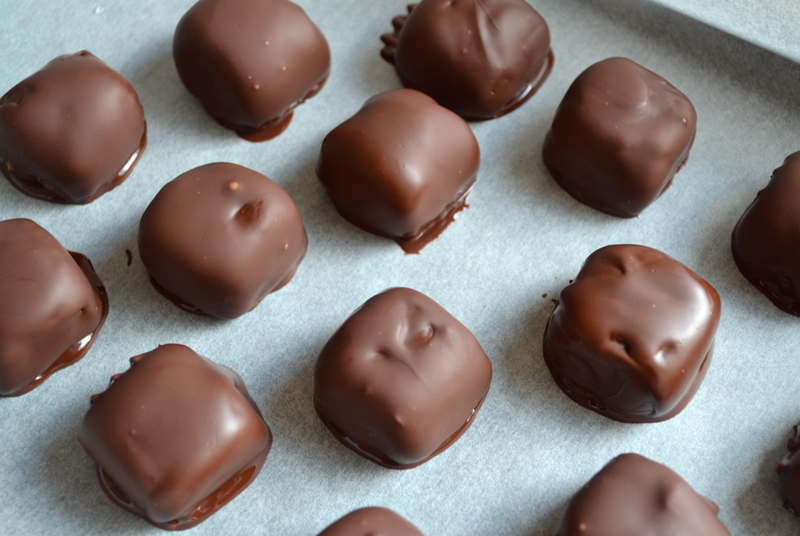 Pop them back in the freezer for another hour for the choc to set and voila. These are at their best eaten right out of the freezer/fridge. Thank you Tamara for visiting the blog, I am glad you like it!